Do not remove the radiator cap when the engine is hot. Serious burns could occur from high pressure coolant escaping from the radiator. Wrap a thick cloth around the cap. Slowly turn it a quarter turn to allow built-up pressure to escape. Carefully remove the cap by turning it all the way. Remove the engine and transaxle assembly. Refer to EM-82, "M/T : Removal and Installation". Disconnect the reverse lamp switch harness connector. Remove the bolts that fasten the transaxle assembly and engine assembly. Remove transaxle assembly from the engine assembly. Remove engine mounting bracket (LH). Refer to EM-82, "M/T : Exploded View". Remove CSC. Refer to CL-16, "Removal and Installation". The transaxle assembly must not interfere with the wire harnesses and clutch tube. Improper alignment caused by missing dowels may cause vibration, oil leaks or breakage of drive train components. 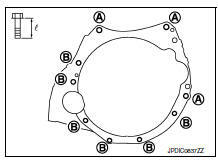 When installing transaxle assembly, do not bring input shaft into contact with clutch cover. Tapping work for tapping bolts is not applied to new transaxle case. Do not perform tapping by other than screwing tapping bolts because tapping is formed by screwing tapping bolts into transaxle case. Tighten transaxle assembly mounting bolts to the specified torque. As shown viewing from the engine. Check the operation of the control linkage. Refer to TM-26, "Inspection". Check the oil level and for oil leaks. Refer to TM-19, "Inspection".